It’s a free days, so we are doing a snack food recipe of minced pork (seasoned) over the bread – “Fried French Bread with Pork Spread“. If anyone has any ideas would be shrimp, chicken instead minced pork it might be taste good and look strange. * Pound coriander roots, garlic and pepper finely to obtain a smooth paste, add into the minced pork. * Follow with half of the beaten egg, soy sauce and water. Knead well. * Cut the bread into quarters, dry in a low temperature oven. Spread 1 tbsp of pork mixture on each piece of bread, and form a dome at the center. 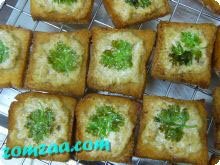 *Brush with the remaining beaten egg, decorate with coriander leaves and red chili. Continue until finished. * Put the oil in a wok, and place over medium-low heat until hot. Deep-fry the bread spread-side down until crispy and golden brown on both sides, remove and drain on absorbent paper. * Arrange on a serving dish, enjoy while hot with cucumber relish. 1. Pork grind and mince (can put the shrimp) until it look finely. Wait a minute then put coriander root, fine-grain black pepper. Then mixed in pork, add soy sauce or seasoning. Massage a little sugar and eggs together here. Leave it (can put it in the fridge). 2. Prepare the bread, choose your favorite brand. If you like style cutting edge to be cut before it. 3. Bread, cut into 4 sections (1 sheet, cut into 4 slide) and leave it for next step. 4. Prepare the pan (more black more delicious, eiei) Heat the oil first, estimated for float over the bread when fry. 6. Bright the mix-minced pork out of the refrigerator. Top up the mix-minced pork on the sliced bread. Then wait for frying. 7. Wash the coriander then divide into half. The other half is used to cool and then place on top the minced pork. Press a little for it stick with minced pork. 8. When oil hot ready, then fried it by put the minced-pork face down. 9. Fry about 2 minutes and swap side (put the top face down), wait a minute when color look little yellow then scoop up. 10. Drop the Fried French Bread with Pork Spread in a colander to drain oil or will it be paper. 11. Serve, eating with cucumber and coriander sauce. It’s not hard, try to cook Fried French Bread with Pork Spread. It has been said that bread is the staff of life and I for one will not disagree with them. The Fried French Bread with Pork Spread recipe I am about to provide you is easily made at home as well as when you go camping or are under some sort of survival exercise !